The city of Kiev has a big variety of public transport: cars, taxes, buses, trams, trolleybuses, and the most popular and used, famous subway of Kyiv. The subway has three lines, two of which cross the Dnieper River through the high bridge. The payment of the travel is done with "zeton" (plastic blue coin), that can be bought in boxes of the metro stations. 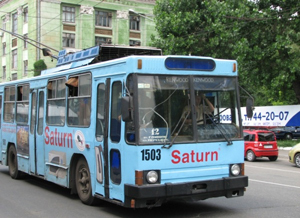 The city of Kiev has a complementary network of trolleybuses and trams. A peculiarity that can surprise foreign visitors is that the travel money is passed from hand to hand, from passenger to passenger until it comes to the driver or to the collector. In Kiev there are is a great variety of little local buses (passenger vans) called "marshrutka". They go in all directions and you can easily catch them and go to any place in Kiev. This transport is very cheap and popular but you must be prepared for crowds. For more comfortable travel in Kiev city it is better to use taxi service. Our advice is not to catch a taxi on the strip but to call the taxi service office and ask for a car. In this way it will be cheaper. There are hundreds of taxi services and the taxi won’t be a problem for you. But if you catch taxi on the street, be ready for the oral agreement about the price! 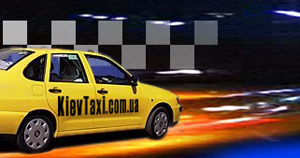 We will give you some phone numbers of taxi services in Kiev. It consists of two lines which were opened in 1978, with an extension of 14 kilometers. Train is the most important transport between cities. The city has a great developed railway infrastructure, including a long-distance passenger trains, 6 stations of cargo, warehouses and repair shops. However, the system has difficulties in its modernization, like the bridges across the river, which are only equipped for a single track, thereby limiting its expansion. That is why the construction of a modern railway station has been planned in the left margin of the Dnieper River, and the construction of bridges is already advanced. But even with these problems, travelling by train is one of the most widely used in Ukraine. It is a good way to travel between Ukrainian cities and neighborhood countries. 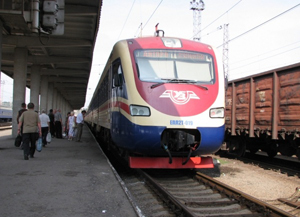 Ukrainian trains connect all the main cities. There are also international trains from key Ukrainian cities to Moscow, St Petersburg, Riga, Minsk, Tallinn, Warsaw, Budapest, Berlin, Prague, Vienna, and Krakow. 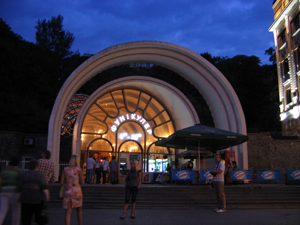 The Kiev funicular (in Ukrainian: Київський фунікулер, transliteration: Kyivs'kyi funikuler; in Russian: Киевский фуникулёр, translit. : Kievskiy funikulior) is developed in Kiev since its construction in 1958, and connects the historic center with the commercial district of the Podilskyi district, along the shore of the Dnieper River. 1 Station Metro “Lybidska” – Street Marshalska. 1-К Station Metro “Lybidska” – Street P. Grabovskogo. 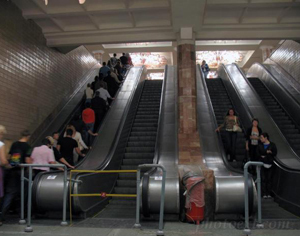 2 Station Metro “Lybidska” – Cibcenter. 3 Station Metro “Palace of Sport” – Zaliznodorozhniy Masyv. 5 Street Belitska – Street Tereshchenkivska. 6 Station Metro “Luk’yanivska” – Street Soshenko. 7 Station Metro “Shulyavska” – Street Decommissioned. 7-К Station Metro “Nyvky” – Street Decommissioned. 8 Square of Lva Tolstogo – Street Smilyanska. 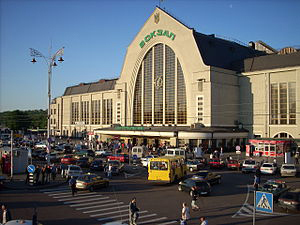 9 Airport “Kiev” – Railway Station. 11 Station Metro “Lybidska” – the Museum of Archeology and way of life of the Ukrainian people. 12 Street Yuria Smolycha – Street Georgiya Dymytrova. 14 Railway Station - Botanic Garden. 16 Street Academica Shchuseva – Independant Square. 17 Square Kosmonavtiv – Street Tereshchenkivska. 18 Street Soshenko – Independent Square. 19 Street Olzhycha – Square Kosmonavtiv. 21 Street Kadetskyi Gayi – Streeet Degtyarivska. 23 Street Academica Tupoleva - Luk’yanivska Square. Dnipropetrovsk is a city located in the Eastern -Central part of Ukraine on the bank of the Dnieper River. With a population of roughly 1.1 million inhabitants, it is a large iron and steel town and still maintains a machine building and aerospace industry. The intercity transportation is represented by cars, buses, trolleybuses and trams, as well as the extensive network of taxis. Dnipropetrovsk is a single-line metro system that serves the city of Dnipropetrovsk, the third largest city in Ukraine by population. The metro was the third system constructed in Ukraine after Kiev and Kharkiv metro systems, respectfully, when it opened on December 29, 1995. Current expansion plans will increase the number of stations to nine by 2014 at the latest. The Dnipropetrovsk Metro is currently the shortest metro system in the world, consisting of one 7.8 kilometres (4.8 mi) line and 6 stations. The system is open from 5:30 in the morning till 23:00 at night, serving a daily passenger traffic of about 37,500 passengers. Trains, cars, local buses are also very popular and widely used in Dnipropertrovsk. 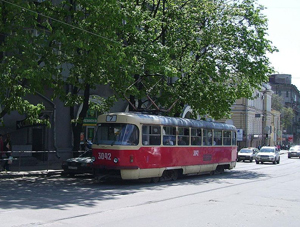 Jarkov tram - one of the main modes of urban public transport in Jarkov and one of the oldest systems of tram in Ukraine (in service since 1906). Farm owned by Gorelektrotrans Kharkiv municipal tram. The network of trolleybuses of Jarkov. The regular traffic is open on May 05, 1939. In January of 2010 there are 26 routes with a total length of 490,6 kilometers. Rate - 1 UAH 50 kopecks (from March 12, 2011). The daily traffic is about 800 thousand passengers (in some days the figure is more than 1 million passengers). This represents 45% of total passengers in urban transport, and the toll traffic - 52%. Each year, Metro carries about 290,0 million passengers. The frequency of trains at rush hour is 2-3 minutes, sometimes 4-6 minutes. By the same range of motion greater than 10 minutes (on average) after 21: 00 pm up to 13-18 minutes after 22: 00. The metro opens at 05.30. 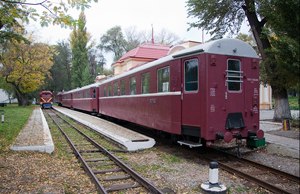 In twelve and thirteen may be possible to change "Metrostroiteley" to "Sport" in the last train in direction to the South Station, and the 0:20 with the "Soviet" (the same train) for the "Historical Museum" of the "Hero of the work" station Saltovskiy line. The train in all lines has 5 cars. Holodnogorsko Zavod (Ukraine Holodnogіrsko-Zavodska), before the line is called "Factory of Sverdlovsk". The total number of railways here is 1442 km! The major highways go through the Kharkov area: Kharkov - Moscow, Kharkov - Simferopol, Kharkov - Rostov-on-Don, Kharkov-Poltava. The Kharkov airport serves internal and international airlines, but specializes basically on passenger transportations. The network of trolleybuses of Kharkov. The regular traffic was opened on May 05, 1939. In January of 2010 there were 26 routes with a total length of 490,6 kilometers. Price for a travel is - 1 UAH 50 kopecks (from March 12, 2011). The daily traffic is about 800 thousand passengers (in some days it can be more than 1 million passengers). This represents 45% of total passengers in urban transport, and the toll traffic - 52%. Each year, metro carries about 290,0 million passengers. Holodnogorsko Zavod (Ukraine Holodnogіrsko-Zavodska), before this name the line was called "Factory of Sverdlovsk".